I’m shopping for salad dressing in the Giant Eagle on Buckeye and E. 115th Street, just around the corner from our house, when I bump into a woman behind me who’s studying canned vegetables. We both laugh and apologize. “Too bad about this place closing soon, huh?” I ask. The woman gives me a confused look. “I think it stays open until at least 9,” she says. It’s a rumor I’ve heard from a few sources since we moved to the neighborhood - that the store is planning to shutter by the end of the year, likely to be replaced by a smaller and more downscale competitor, such as Sav-a-Lot. I grab my salad dressing, an organic store-brand featuring bits of fancy cheese, then head to produce. There, in a refrigerated end cap, I’m surprised to see a fully-stocked display of kombucha, the trendy health elixir of the moment. It’s on sale ($2.50), and I’m not above trendy health elixirs, so I pick one up and head to the check out. The place seems popular, so I’m puzzled by its cloudy fate. I call Giant Eagle’s media relations department to check the rumors, and speak to a friendly guy named Billy who promises to call me back by the end of the day. 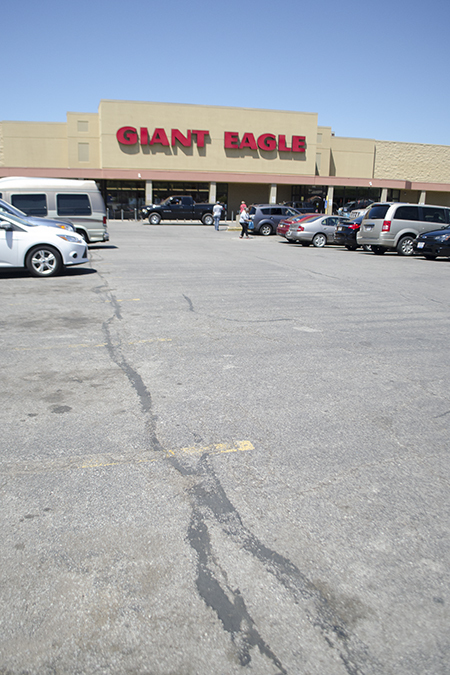 In some ways, it’s surprising that a Giant Eagle exists on Buckeye Road at all. At least in Northeast Ohio, the Pittsburgh-based chain seems to eschew urban neighborhoods in favor of the suburbs. Aside from this store, it operates just three other stores in the city proper - all on the far west side. The store anchors the yawning Buckeye Plaza shopping center, which also contains a dollar store and some fast food restaurants. With its enormous surface parking lot fronting on Buckeye, the center marks the western end of the pedestrian-friendly part of the commercial corridor. Buckeye-Shaker is actually one of only a handful of East Side neighborhoods where the majority of census tracts don't qualify as being "low-income, low-access". That's a term the USDA's Food Access Research Atlas uses to describe urban census tracts where there are significant numbers of low-income residents at least one-half mile from the nearest supermarket. Even if the store does close, the neighborhood would remain in comparatively good shape grocery-wise, not only because of Dave’s but also the weekly (and year-round) Shaker Square farmer’s market, one of the region’s most bounteous. Still, the on-the-ground impact would likely be more significant. Yes, Dave’s is nearby, but it’s not as convenient to reach from most parts of the neighborhood as Giant Eagle. The farmer’s market happens only once a week. And while chains such as Sav-a-Lot do offer produce, the variety and freshness pales in comparison to larger stores. They certainly ain’t selling organic dressing and kombucha. I wonder if Giant Eagle would say demand doesn’t exist in Buckeye for these types of products, either because of price or culture or both. But as D’Angelo pointed out when I was talking to him the other day, there’s little chance of creating demand for healthier food when there’s no convenient option to buy it. That’s a quandary he faces every day in his work as a councilmember for the Healthy Eating Active Living initiative, which focuses not only on Buckeye but also neighborhood areas that do qualify as USDA food deserts. Food access aside, there’d be the psychological effect of seeing such a major store close in a neighborhood where the commercial corridor is already half vacant. This isn’t Giant Eagle’s responsibility any more than it was the responsibility of the many mom-and-pop stores that preceded it, but it’s hard not to cringe at the gap its absence would leave in the neighborhood landscape. After leaving the store, I head over to Club L&M to see if I can grab a few minutes with the owner, who was so busy when we stopped over the other day with D’Angelo. This time, there’s hardly anyone else standing with him outside the garage. I walk up and introduce myself. He remembers me right away and tells me his name is Landon. Landon is friendly right off the bat, happy to open up about his shop’s complex history in the neighborhood. As he talks, he has a habit of taking off his baseball cap to pull back a full head of long, graying hair. He originally opened, he says, in a storefront on Buckeye itself, as a motorbike-repair and -sales shop. He couldn’t afford an in-store security system, though, so he and his family would often spend the night in the store to deter burglars. Eventually, he says the odd hours made police and others assume he was selling heroin or marijuana out of the store. He was pressured to move to his current location, where he’s been operating for a few years now. “I let boys from the neighborhood hang out, teach them how to fix bikes, pay them on the spot,” he says. “I figure it keeps them from robbing houses or selling drugs.” Only when he’s especially busy, he says, does he kick the kids out, making all repairs himself to save time. That charitable side-purpose comes from his own experiences of random street violence when he was younger. He was a boxer back then, and one night, coming out of the gym, he got mixed up in an argument on the street. He got pistol-whipped in the face by a guy who was aiming for someone else. His nose remains scarred and misshapen from the wound. He spies my half-drunk kombucha, which I’m only half-consciously carrying. I tell him, a little embarrassed to be talking about yuppie health drinks in this context. “It’s supposed to be good for your digestive system,” I say sheepishly. He’s happy when I tell him I bought it right around the corner at Giant Eagle. He thought the nearest retailer was the Whole Foods in suburban University Heights. “I’ll have to remember that,” he says. He’s about to close up shop, so I say goodnight. This time, I choose not to spread the bad news about the store closing. Not only because I don’t know for sure it’s true - but because for tonight, I’d rather savor the unexpected pleasure of bonding with a motorbike guy over the wonders of fungus-water.